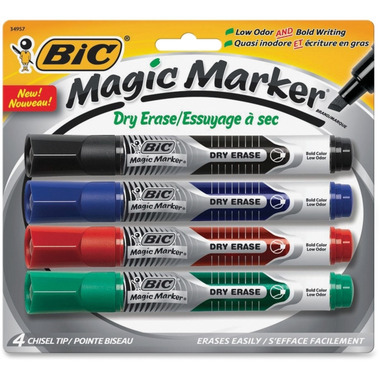 Bic Erase Magic Markers with Chisel Tip deliver low odor and bold writing in one marker. Use the chisel tip, made of acrylic fiber, for broad lines or fine underlining. Marks erase easily and provide smooth, consistent ink flow and the visible ink supply lets you monitor level of liquid ink.